By: Kaufmann Kohler, Richard Gottheil, Henri Cordier, Executive Committee of the Editorial Board. Jews Known as "Tiao Kiu Kiaou." 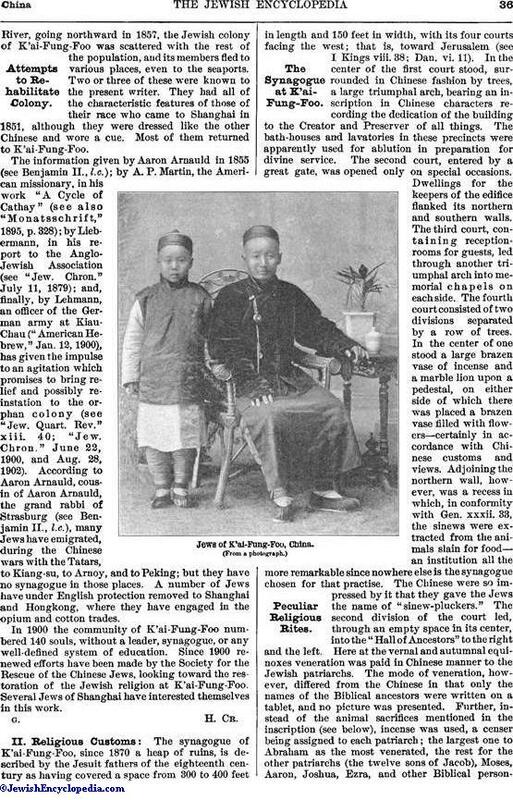 High Reputation of Chinese Jews. The southeastern and main division of the Chinese empire. 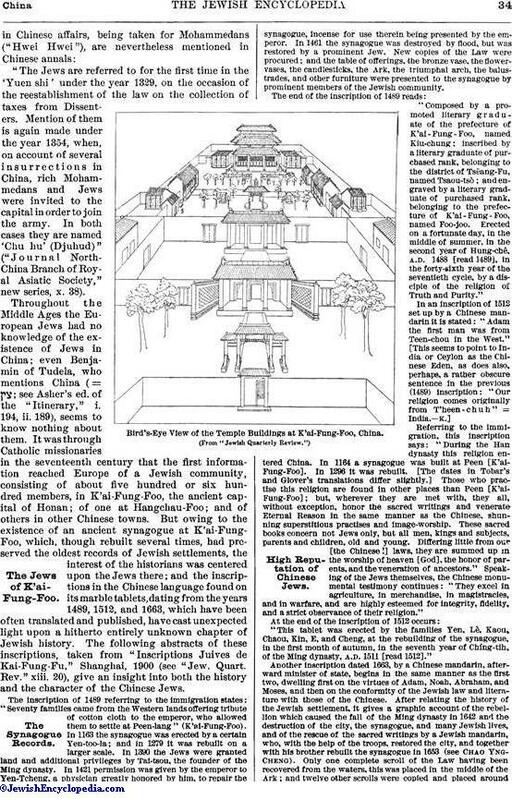 The subject of the Jews in China is here treated in two sections: I. Their history; II. Their religious customs, etc. Whether China was known to Biblical writers is a matter of dispute among scholars. The majority of Bible commentators identify it with ("the land of the Sinim"), whence the deported sons of Israel shall return to their land (Isa. xlix. 12); others, however, deny the identification. At any rate, the Jews in Persia from early times were connected with the silktrade, and, as a consequence, entered into direct relations with the "silkmen" ("Seres," from "ser" = = "sericum" = "silk"), as the Chinese were called by the Romans. (For the identification see commentaries of Gesenius, Delitzsch, Hitzig, Cheyne, and Orelli; also Kautzsch, in Riehm's "Handwörterbuch der Biblischen Alterthümer," s.v. "Sinim"; Von Strauss-Torney, in Delitzsch's "Isaiah," P. 712; Lassen, "Indische Alterthumskunde," 1867, i. 1028; further, Dillmann, Duhm, and Marti, in their commentaries; Könlg, in Hauck's "Real-Encyc." s.v. "Sinim"; and Von Richthofen, "China," i. 436; for the "Seres," see Silk; Kohler, "The Jews and Commerce," in "The Menorah," 1887, p. 211; Heyd, "Gesch. des Levantehandels," i. 12, notes 1, 24; compare Mommsen, "Römische Gesch." v. 346, 465-470; Herzfeld, "Handelsgesch. der Juden," pp. 110, 308). At what time, however, the first Jewish settlement in China took place it is difficult to say. In all likelihood Jewish merchants immigrated, or changed a temporary sojourn into a permanent one, at various epochs. In an "Account Written by Two Mohammedan Travelers Through India and China" in 851 (Renaudot, transl., London, 1733, p. 42), it is stated that "the Jews have been settled in that empire [China] from time immemorial." Notwithstanding this, it is as hazardous to connect the first Jewish settlement in China with the Lost Ten Tribes ("Jew. Quart. Rev." xiii. 23) as it is an unwarranted skepticism to doubt the correctness of the tradition of the Chinese Jews themselves, which traces the first immigration back to the Han dynasty between 206 B.C. and 221 C.E. (Möllendorf, in "Monatsschrift," 1895, p. 329), and more exactly to the time of the emperor Ming-ti. This opinion is based upon the oral tradition of the Jews, reported by Father Brotier: "These Jews say that they entered China under the Han dynasty during the reign of Han Ming-ti [58-76 C.E.]." And further: "Several of these Jews have assured me that they arrived during the reign of Ming-ti" (Tobar, "Inscrip. Juives de Kai-Fung-Fu," p. 90). A certain Sulaiman (Jewish traveler of the ninth century) similarly claims that they entered in 65 C.E. Grätz (iv. 376) places the first immigration in the year 231 C.E., connecting it with the persecution of Jews in Persia, which caused also their first settlement in India; furthermore, the Jews of K'ai-Fung-Foo themselves claim that they received their religion from India (compare Finn, "The Orphan Colony of Jews in China," p. 40; but see passages cited below); but there is nothing to support this hypothetical date, or the statement of Glover in the "Babylonian and Oriental Record," vi. 247, 288; vii. 149, that the Jews were not in China before the fifth century. On the other hand there are many reasons for the assumption of an earlier date. The Chinese everywhere call the Jews "Tiao Kiu Kiaou" (the sect which extracts the sinews, after Gen. xxxii. 33); and this name itself, as a characterization of the Jews, indicates great antiquity. Rabbinical Judaism would have suggested more distinctive peculiarities of the Jews to the Chinese. As will be shown later, there are also many intrinsic evidences of early Jewish settlements in China to be found in peculiar rites, preserved in connection with their synagogue; the records which will be cited below are obviously copies of older documents; and there is also the fact that the Arabic writers of the ninth and fourteenth centuries confirm the existence of old Jewish commercial colonies in China. Indeed, all facts tend to show a long and peculiar development of religious as well as social life of the Jews in China, the beginnings of which can hardly have been later than the first Christian century. Concerning the history of the Chinese Jews in the Middle Ages a very few isolated facts are known. The two Mohammedan travelers of 851 who are quoted above state that at that period "many of them, for the sake of riches and preferment, have abjured their own religion." This is corroborated by Abu Zaid Hasan al-Sirafi (Reinaud, "Géographie d'Abulfeda," i. lxxxiii., Paris, 1848), according to whom "120,000 Mohammedans, Jews, Christians, and Parsees, who had come there for commerce, were in the revolt of Baichu in the year 884 massacred in Canfu, the chief port for all the Arabian merchants." It seems very probable that in the tenth century a new colony of Jews came into China, as Professor Chavannes declares: "Between 960 and 1126 (Sung dynasty) Jews coming from India brought, for the first time, as tribute to the court of China, stuffs from western maritime countries ('si yang poo'). The Jews came to China by sea, and not by crossing central Asia; they were members of the Jewish colonies settled in India. Lastly, their arrival does not appear to have been prior to the end of the tenth century C.E." Marco Polo refers to the powerful commercial and political influence of the Jews in China in 1286 (see Murray's translation of "Polo's Travels," p. 99). Ibn Batuta (see "Monatsschrift," 1895, p. 329) in the fourteenth century speaks of Al-Khansa—which Möllendorf identifies with Hangchau; Neubauer ("Jew. Quart. Rev." x. 125) with Canfu—as having many resident Mohammedans, Jews, and Christians. "The Jews are referred to for the first time in the 'Yuen shi' under the year 1329, on the occasion of the reestablishment of the law on the collection of taxes from Dissenters. Mention of them is again made under the year 1354, when, on account of several insurrections in China, rich Mohammedans and Jews were invited to the capital in order to join the army. In both cases they are named 'Chu hu' (Djuhud)" ("Journal North-China Branch of Royal Asiatic Society," new series, x. 38). Throughout the Middle Ages the European Jews had no knowledge of the existence of Jews in China; even Benjamin of Tudela, who mentions China (= ; see Asher's ed. of the "Itinerary," i. 194, ii. 189), seems to know nothing about them. 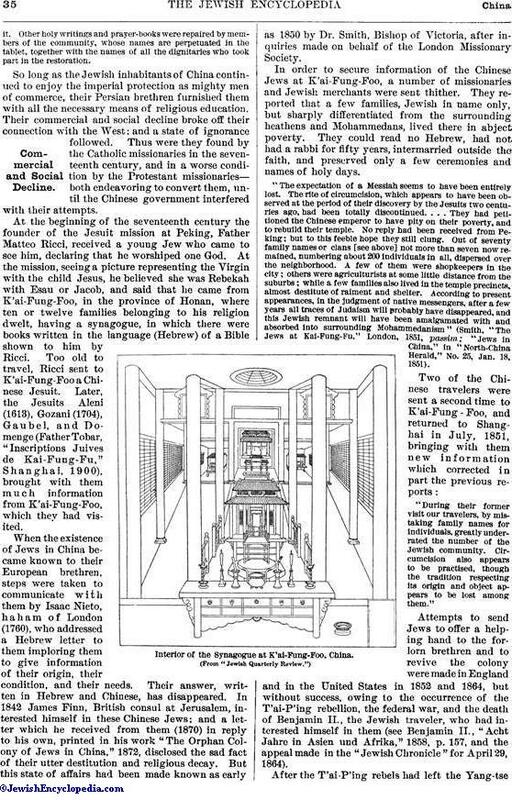 It was through Catholic missionaries in the seventeenth century that the first information reached Europe of a Jewish community, consisting of about five hundred or six hundred members, in K'ai-Fung-Foo, the ancient capital of Honan; of one at Hangehau-Foo; and of others in other Chinese towns. But owing to the existence of an ancient synagogue at K'ai-Fung-Foo, which, though rebuilt several times, had preserved the oldest records of Jewish settlements, the interest of the historians was centered upon the Jews there; and the inscriptions in the Chinese language found on its marble tablets, dating from the years 1489, 1512, and 1663, which have been often translated and published, have cast unexpected light upon a hitherto entirely unknown chapter of Jewish history. The following abstracts of these inscriptions, taken from "Inscriptions Juives de Kai-Fung-Fu," Shanghai, 1900 (see "Jew. Quart. Rev." xiii. 20), give an insight into both the history and the character of the Chinese Jews. The inscription of 1489 referring to the immigration states: "Seventy families came from the Western lands offering tribute of cotton cloth to the emperor, who allowed them to settle at Peen-lang" (K'ai-Fung-Foo). In 1163 the synagogue was erected by a certain Yen-too-la; and in 1279 it was rebuilt on a larger scale. In 1390 the Jews were granted land and additional privileges by Tai-tsou, the founder of the Ming dynasty. In 1421 permission was given by the emperor to Yen-Tcheng, a physician greatly honored by him, to repair the synagogue, incense for use therein being presented by the emperor. In 1461 the synagogue was destroyed by flood, but was restored by a prominent Jew. 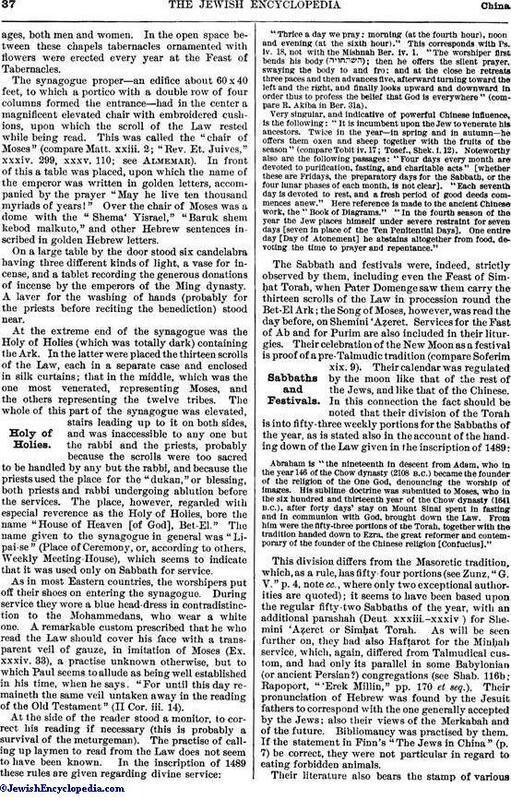 New copies of the Law were procured; and the table of offerings, the bronze vase, the flowervases, the candlesticks, the Ark, the triumphal arch, the balustrades, and other furniture were presented to the synagogue by prominent members of the Jewish community. "Composed by a promoted literary graduate of the prefecture of K'ai-Fung-Foo, named Kiu-chung; inscribed by a literary graduate of purchased rank, belonging to the district of Tsëang-Fu, named Tsaou-tsò; and engraved by a literary graduate of purchased rank, belonging to the prefecture of K'ai-Fung-Foo, named Foo-joò. Erected on a fortunate day, in the middle of summer, in the second year of Hung-chè, A.D. 1488 [read 1489], in the forty-sixth year of the seventieth cycle, by a disciple of the religion of Truth and Purity." In an inscription of 1512 set up by a Chinese mandarin it is stated: "Adam the first man was from Teen-chou in the West." [This seems to point to India or Ceylon as the Chinese Eden, as does also, perhaps, a rather obscure sentence in the previous (1489) inscription: "Our religion comes originally from T'heen-chuh" = India. Bird's-Eye View of the Temple Buildings at K'al-Fung-Foo, China. (From "Jewish Quarterly Review. 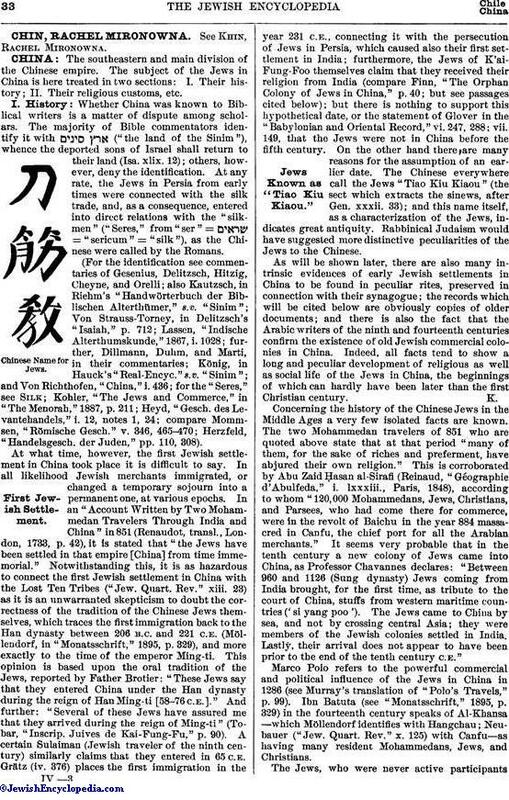 ")High Reputation of Chinese Jews. Referring to the immigration, this inscription says: "During the Han dynasty this religion entered China. In 1164 a synagogue was built at peen [K'ai-Fung-Foo]. In 1296 it was rebuilt. [The dates in Tobar's and Glover's translations differ slightly.] Those who practise this religion are found in other places than Peen [K'ai-Fung-Foo]; but, wherever they are met with, they all, without exception, honor the sacred writings and venerate Eternal Reason in the same manner as the Chinese, shunning superstitious practises and image-worship. These sacred books concern not Jews only, but all men, kings and subjects, parents and children, old and young. Differing little from our [the Chinese!] laws, they are summed up in the worship of heaven [God], the honor of parents, and the veneration of ancestors." Speaking of the Jews themselves, the Chinese monumental testimony continues: "They excel in agriculture, in merchandise, in magistracies, and in warfare, and are highly esteemed for integrity, fidelity, and a strict observance of their religion." "This tablet was erected by the families Yen, Lè, Kaou, Chaou, Kin, E, and Cheng, at the rebuilding of the synagogue, in the first month of autumn, in the seventh year of Chíng-un of the Ming dynasty, A.D. 1511 [read 1512]." Another inscription dated 1663, by a Chinese mandarin, afterward minister of state, begins in the same manner as the first two, dwelling first on the virtues of Adam, Noah, Abraham, and Moses, and then on the conformity of the Jewish law and literature with those of the Chinese. After relating the history of the Jewish settlement, it gives a graphic account of the rebellion which caused the fall of the Ming dynasty in 1642 and the destruction of the city, the synagogue, and many Jewish lives, and of the rescue of the sacred writings by a Jewish mandarin, who, with the help of the troops, restored the city, and together with his brother rebuilt the synagogue in 1653 (See Chao Yng-Cheng). Only one complete scroll of the Law having been recovered from the waters, this was placed in the middle of the Ark; and twelve other scrolls were copied and placed aroundit. Other holy writings and prayer-books were repaired by members of the community, whose names are perpetuated in the tablet, together with the names of all the dignitaries who took part in the restoration. So long as the Jewish inhabitants of China continued to enjoy the imperial protection as mighty men of commerce, their Persian brethren furnished them with all the necessary means of religious education. Their commercial and social decline broke off their connection with the West; and a state of ignorance followed. Thus were they found by the Catholic missionaries in the seventeenth century, and in a worse condition by the Protestant missionaries—both endeavoring to convert them, until the Chinese government interfered with their attempts. At the beginning of the seventeenth century the founder of the Jesuit mission at Peking, Father Matteo Ricci, received a young Jew who came to see him, declaring that he worshiped one God. At the mission, seeing a picture representing the Virgin with the child Jesus, he believed she was Rebekah with Esau or Jacob, and said that he came from K'ai-Fung-Foo, in the province of Honan, where ten or twelve families belonging to his religion dwelt, having a synagogue, in which there were books written in the language (Hebrew) of a Bible shown to him by Ricci. Too old to travel, Ricci sent to K'ai-Funz-Foo a Chinese Jesuit. Later, the Jesuits Aleni (1613), Gozani (1704), Gaubel, and Domenge (Father Tobar, "Inscriptions Juives de Kai-Fung-Fu," Shanghai, 1900), brought with them much information from K'ai-Fung-Foo, which they had visited. When the existence of Jews in China became known to their European brethren, steps were taken to communicate with them by Isaac Nieto, haham of London (1760), who addressed a Hebrew letter to them imploring them to give information of their origin, their condition, and their needs. Their answer, written in Hebrew and Chinese, has disappeared. 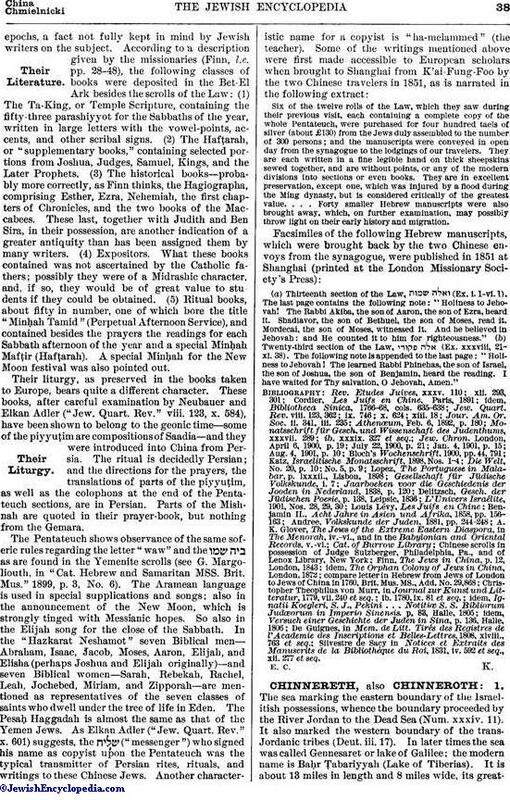 In 1842 James Finn, British consul at Jerusalem, interested himself in these Chinese Jews; and a letter which he received from them (1870) in reply to his own, printed in his work "The Orphan Colony of Jews in China," 1872, disclosed the sad fact of their utter destitution and religious decay. But this state of affairs had been made known as early as 1850 by Dr. Smith, Bishop of Victoria, after inquiries made on behalf of the London Missionary Society. In order to secure information of the Chinese Jews at K'ai-Fung-Foo, a number of missionaries and Jewish merchants were sent thither. They reported that a few families, Jewish in name only, but sharply differentiated from the surrounding heathens and Mohammedans, lived there in abject poverty. They could read no Hebrew, had not had a rabbi for fifty years, intermarried outside the faith, and preserved only a few ceremonies and names of holy days. "The expectation of a Messiah seems to have been entirely lost. The rite of circumcision, which appears to have been observed at the period of their discovery by the Jesuits two centuries ago, had been totally discontinued. . . . They had petitioned the Chinese emperor to have pity on their poverty, and to rebuild their temple. No reply had been received from Peking; but to this feeble hope they still clung. Out of seventy family names or clans [see above] not more than seven now remained, numbering about 200 individuals in all, dispersed over the neighborhood. A few of them were shopkeepers in the city; others were agriculturists at some little distance from the suburbs; while a few families also lived in the temple precincts, almost destitute of raiment and shelter. According to present appearances, in the judgment of native messengers, after a few years all traces of Judaism will probably have disappeared, and this Jewish remnant will have been amalgamated with and absorbed into surrounding Mohammedanism". "During their former visit our travelers, by mistaking family names for individuals, greatly underrated the number of the Jewish community. Circumcision also appears to be practised, though the tradition respecting its origin and object appears to be lost among them." Attempts to send Jews to offer a helping hand to the forlorn brethren and to revive the colony were made in England and in the United States in 1852 and 1864, but without success, owing to the occurrence of the T'ai-P'ing rebellion, the federal war, and the death of Benjamin II., the Jewish traveler, who had interested himself in them (see Benjamin II., "Acht Jahre in Asien und Afrika," 1858, p. 157, and the appeal made in the "Jewish Chronicle" for April 29, 1864). Interior of the Synagogue at K'ai-Fung-Foo, China. (From "Jewish Quarterly Review. ")Attempts to Rehabilitate Colony. After the T'ai-P'ing rebels had left the Yang-tseRiver, going northward in 1857, the Jewish colony of K'ai-Fung-Foo was scattered with the rest of the population, and its members fled to various places, even to the seaports. Two or three of these were known to the present writer. 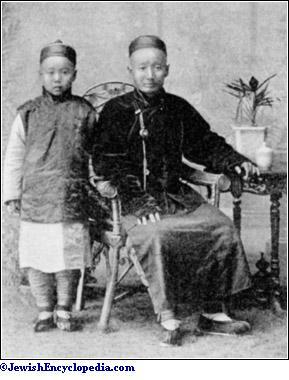 They had all of the characteristic features of those of their race who came to Shanghai in 1851, although they were dressed like the other Chinese and wore a cue. Most of them returned to K'ai-Fung-Foo. The information given by Aaron Arnauld in 1855 (see Benjamin II, l.c. ); by A. P. Martin, the American missionary, in his work "A Cycle of Cathay" (see also "Monatsschrift," 1895, p. 328); by Liebermann, in his report to the Anglo-Jewish Association (see "Jew. Chron," July 11, 1879); and, finally, by Lehmann, an officer of the German army at Kiau-Chau ("American Hebrew," Jan. 12, 1900), has given the impulse to an agitation which promises to bring relief and possibly reinstation to the orphan colony (see "Jew. Quart. Rev." xiii. 40; "Jew. Chron." June 22, 1900, and Aug. 28, 1902). According to Aaron Arnauld, cousin of Aaron Arnauld, the grand rabbi of Strasburg (see Benjamin II., l.c. ), many Jews have emigrated, during the Chinese wars with the Tatars, to Kiang-su, to Arnoy, and to Peking; but they have no synagogue in those places. A number of Jews have under English protection removed to Shanghai and Hongkong, where they have engaged in the opium and cotton trades. In 1900 the community of K'ai-Fung-Foo numbered 140 souls, without a leader, synagogue, or any well-defined system of education. Since 1900 renewed efforts have been made by the Society for the Rescue of the Chinese Jews, looking toward the restoration of the Jewish religion at K'ai-Fung-Foo. Several Jews of Shanghai have interested themselves in this work. G. H. Cr.II. Religious Customs: The Synagogue at K'ai-Fung-Foo. The synagogue of K'ai-Fung-Foo, since 1870 a heap of ruins, is described by the Jesuit fathers of the eighteenth century as having covered a space from 300 to 400 feet in length and 150 feet in width, with its four courts facing the west; that is, toward Jerusalem (see I Kings viii. 38; Dan. vi. 11). In the center of the first court stood, surrounded in Chinese fashion by trees, a large triumphal arch, bearing an inscription in Chinese characters recording the dedication of the building to the Creator and Preserver of all things. The bath-houses and lavatories in these precincts were apparently used for ablution in preparation for divine service. The second court, entered by a great gate, was opened only on special occasions. Dwellings for the keepers of the edifice flanked its northern and southern walls. The third court, containing receptionrooms for guests, led through another triumphal arch into memorial chapels on each side. The fourth court consisted of two divisions separated by a row of trees. In the center of one stood a large brazen vase of incense and a marble lion upon a pedestal, on either side of which there was placed a brazen vase filled with flowers—certainly in accordance with Chinese customs and views. Adjoining the northern wall, however, was a recess in which, in conformity with Gen. xxxii. 33, the sinews were extracted from the animals slain for food—an institution all the more remarkable since nowhere else is the synagogue chosen for that practise. The Chinese were so impressed by it that they gave the Jews the name of "sinew-pluckers." The second division of the court led, through an empty space in its center, into the "Hall of Ancestors" to the right and the left. Here at the vernal and autumnal equinoxes veneration was paid in Chinese manner to the Jewish patriarchs. The mode of veneration, however, differed from the Chinese in that only the names of the Biblical ancestors were written on a tablet, and no picture was presented. Further, instead of the animal sacrifices mentioned in the inscription (see below), incense was used, a censer being assigned to each patriarch; the largest one to Abraham as the most venerated, the rest for the other patriarchs (the twelve sons of Jacob), Moses, Aaron, Joshua, Ezra, and other Biblical person-ages,both men and women. In the open space between these chapels tabernacles ornamented with flowers were erected every year at the Feast of Tabernacles. 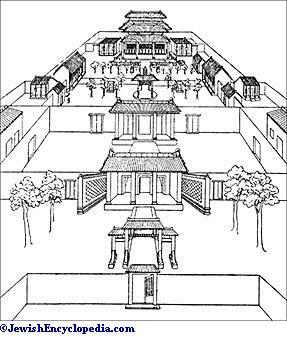 The synagogue proper—an edifice about 60 × 40 feet, to which a portico with a double row of four columns formed the entrance—had in the center a magnificent elevated chair with embroidered cushions, upon which the scroll of the Law rested while being read. This was called the "chair of Moses" (compare Matt. xxiii. 2; "Rev. Et. Juives," xxxiv. 299, xxxv. 110; see Almemar). In front of this a table was placed, upon which the name of the emperor was written in golden letters, accompanied by the prayer "May he live ten thousand myriads of years!" Over the chair of Moses was a dome with the "Shema' Yisrael," "Baruk shem kebod malkuto," and other Hebrew sentences inscribed in golden Hebrew letters. On a large table by the door stood six candelabra having three different kinds of light, a vase for incense, and a tablet recording the generous donations of incense by the emperors of the Ming dynasty. A laver for the washing of hands (probably for the priests before reciting the benediction) stood near. At the extreme end of the synagogue was the Holy of Holies (which was totally dark) containing the Ark. In the latter were placed the thirteen scrolls of the Law, each in a separate case and enclosed in silk curtains; that in the middle, which was the one most venerated, representing Moses, and the others representing the twelve tribes. 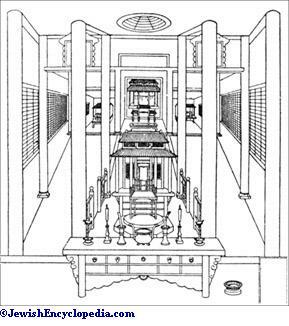 The whole of this part of the synagogue was elevated, stairs leading up to it on both sides, and was inaccessible to any one but the rabbi and the priests, probably because the scrolls were too sacred to be handled by any but the rabbi, and because the priests used the place for the "dukan," or blessing, both priests and rabbi undergoing ablution before the services. The place, however, regarded with especial reverence as the Holy of Holies, bore the name "House of Heaven [of God], Bet-El." The name given to the synagogue in general was "Li-pai-se" (Place of Ceremony, or, according to others, Weekly Meeting-House), which seems to indicate that it was used only on Sabbath for service. As in most Eastern countries, the worshipers put off their shoes on entering the synagogue. During service they wore a blue head-dress in contradistinction to the Mohammedans, who wear a white one. A remarkable custom prescribed that he who read the Law should cover his face with a transparent veil of gauze, in imitation of Moses (Ex. xxxiv. 33), a practise unknown otherwise, but to which Paul seems to allude as being well established in his time, when he says; "For until this day remaineth the same veil untaken away in the reading of the Old Testament" (II Cor. iii. 14). "Thrice a day we pray; morning (at the fourth hour), noon, and evening (at the sixth hour)." This corresponds with Ps. lv. 18, not with the Mishnah Ber. iv. 1. "The worshiper first bends his body ( ); then he offers the silent prayer, swaying the body to and fro: and at the close he retreats three paces and then advances five, afterward turning toward the left and the right, and finally looks upward and downward in order thus to profess the belief that God is everywhere". Very singular, and indicative of powerful Chinese influence, is the following: "It is incumbent upon the Jew to venerate his ancestors. Twice in the year—in spring and in autumn—he offers them oxen and sheep together with the fruits of the season" (compare Tobit iv. 17; Tosef., Shek. i. 12). Noteworthy also are the following passages: "Four days every month are devoted to purification, fasting, and charitable acts" [whether these are Fridays, the preparatory days for the Sabbath, or the four lunar phases of each month, is not clear]. "Each seventh day is devoted to rest, and a fresh period of good deeds commences anew." Here reference is made to the ancient Chinese work, the "Book of Diagrams." "In the fourth season of the year the Jew places himself under severe restraint for seven days [seven in place of the Ten Penitential Days]. One entire day [Day of Atonement] he abstains altogether from food, devoting the time to prayer and repentance." Abraham is "the nineteenth in descent from Adam, who in the year 146 of the Chow dynasty (2108 B.C.) became the founder of the religion of the One God, denouncing the worship of images. His sublime doctrine was submitted to Moses, who in the six hundred and thirteenth year of the Chow dynasty (1641 B.C. ), after forty days' stay on Mount Sinai spent in fasting and in communion with God, brought down the Law. From him were the fifty-three portions of the Torah, together with the tradition handed down to Ezra, the great reformer and contemporary of the founder of the Chinese religion [Confucius]." This division differs from the Masoretic tradition, which, as a rule, has fifty-four portions (see Zunz, "G. V." p. 4, note cc., where only two exceptional authorities are quoted); it seems to have been based upon the regular fifty-two Sabbaths of the year, with an additional parashah (Deut. xxxiii-xxxiv) for Shemini 'Aẓeret or Simḥat Torah. As will be seen further on, they had also Hafṭarot for the Minḥah service, which, again, differed from Talmudical custom, and had only its parallel in some Babylonian (or ancient Persian?) congregations (see Shab. 116b; Rapoport, "'Erek Millin" pp. 170 et seq.). Their pronunciation of Hebrew was found by the Jesuit fathers to correspond with the one generally accepted by the Jews; also their views of the Merkabah and of the future. Bibliomancy was practised by them. If the statement in Finn's "The Jews in China" (p. 7) be correct, they were not particular in regard to eating forbidden animals. Their literature also bears the stamp of variousepochs, a fact not fully kept in mind by Jewish writers on the subject. According to a description given by the missionaries (Finn, l.c. pp. 28-48), the following classes of books were deposited in the Bet-El Ark besides the scrolls of the Law: (1) The Ta-King, or Temple Scripture, containing the fifty-three Parashiyyot for the Sabbaths of the year, written in large letters with the vowel-points, accents, and other scribal signs. (2) The Hafṭarah, or "supplementary books," containing selected portions from Joshua, Judges, Samuel, Kings, and the Later Prophets. (3) The historical books—probably more correctly, as Finn thinks, the Hagiographa, comprising Esther, Ezra, Nehemiah, the first chapters of Chronicles, and the two books of the Maccabees. These last, together with Judith and Ben Sira, in their possession, are another indication of a greater antiquity than has been assigned them by many writers. (4) Expositors. What these books contained was not ascertained by the Catholic fathers; possibly they were of a Midrashic character, and, if so, they would be of great value to students if they could be obtained. (5) Ritual books, about fifty in number, one of which bore the title "Minḥah Tamid" (Perpetual Afternoon Service), and contained besides the prayers the readings for each Sabbath afternoon of the year and a special Minḥah Mafṭir (Hafṭarah). A special Minḥah for the New Moon festival was also pointed out. Their liturgy, as preserved in the books taken to Europe, bears quite a different character. These books, after careful examination by Neubauer and Elkan Adler ("Jew. Quart. Rev." viii. 123, x. 584), have been shown to belong to the geonic time—some of the piyyuṭim are compositions of Saadia—and they were introduced into China from Persia. The ritual is decidedly Persian; and the directions for the prayers, the translations of parts of the piyyuṭim, as well as the colophons at the end of the Pentateuch sections, are in Persian. Parts of the Mishnah are quoted in their prayer-book, but nothing from the Gemara. Six of the twelve rolls of the Law, which they saw during their previous visit, each containing a complete copy of the whole Pentateuch, were purchased for four hundred taels of silver (about £130) from the Jews duly assembled to the number of 300 persons; and the manuscripts were conveyed in open day from the synagogue to the lodgings of our travelers. They are each written in a fine legible hand on thick sheepskins sewed together, and are without points, or any of the modern divisions into sections or even books. They are in excellent preservation, except one, which was injured by a flood during the Ming dynasty, but is considered critically of the greatest value. . . . Forty smaller Hebrew manuscripts were also brought away, which, on further examination, may possibly throw light on their early history and migration. (a) Thirteenth section of the Law, (Ex. i. 1-vi. 1). The last page contains the following note: "Holiness to Jehovah! The Rabbi Akiba, the son of Aaron, the son of Ezra, heard it. Shadiavor, the son of Bethuel, the son of Moses, read it. Mordecai, the son of Moses, witnessed it. And he believed in Jehovah: and He counted it to him for righteousness." (b) Twenty-third section of the Law, (Ex. xxxviii, 21-xl. 38). The following note is appended to the last page: "Holiness to Jehovah! The learned Rabbi Phinehas, the son of Israel, the son of Joshua, the son of Benjamin, heard the reading. I have waited for Thy salvation, O Jehovah, Amen." Silvestre de Sacy in Notices et Extraits des Manuscrits de la Bibliothèque du Roi, 1831, iv. 592 et seq., xii. 277 et seq.